The State Executive Committee of the Green Party of Mississippi has voted to endorse the statement of the Green Party of the United States strongly condemning President Bush's intended military action against Iraq. The GPUS anti-war statement was drafted by the party's International Committee and passed by unanimous vote of the Coordinating Committee, which includes delegates from 39 states and the District of Columbia. This GPUS statement unites Greens nationwide against the threat of military action. It echoes a September anti-war statement from the Green/EFA Group in the European Parliament. Condemning President Bush's invasion plans, the European Green statement "supports those voices raised in the US against such an intervention." Greens internationally are calling for multilateral diplomatic strategies, beginning with a resumption of UN inspections of Iraqi weapon systems, rather than unilateral use of force. "Nonviolence is one of the Ten Key Values of Greens worldwide," said Janet Rafferty, the Mississippi state Green Party chair. 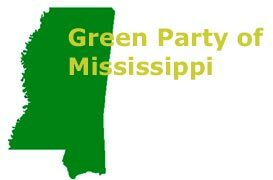 "We Mississippi Greens thus want to express our support of the millions of people of good conscience all over the world, Greens and others alike, who oppose Bush's war plans." Greens note that the US is already at war with Iraq -- a low intensity war, with bombing raids every month. Between the destruction of infrastructure and the sanctions, hundreds of thousands of Iraqi civilians have died during the past decade, including half a million children, according to UN figures. Mississippi Greens are thus urging state citizens who oppose war with Iraq to make their wishes known. SEC member Will Watson of Long Beach advises that, "Mississippians who want peace should contact the President, their senators and representative and demand that the nation's slide towards war be halted." Rafferty concluded, "If we waged peace as energetically as we wage war, the USA could usher in a new era of respect for democracy and human rights. War, sadly, always renders these things expendable. And that's a truly evil idea, right now, or ever." The GPUS Statement in Opposition to the War can be read at www.greenparties.org.